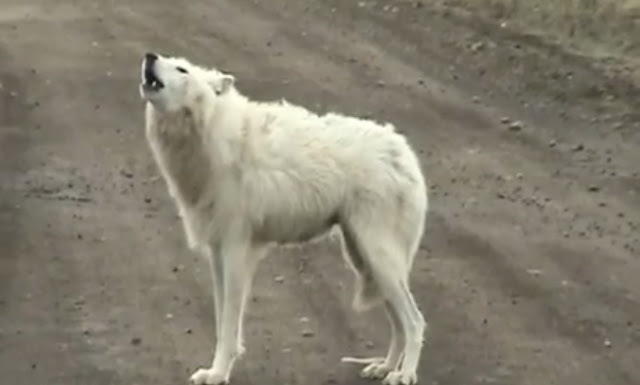 No other wolf in the world can offer the same coloring as the Arctic Wolf. It is very unique due to the location where it is found. While some species of wolves do have some white coloring, this one is almost completely white. They do offer some aspects of yellow, gray, and black in places though. Due to the extreme cold where the Arctic Wolf lives, they have two thick layers of fur. The outer layer actually gets thicker as the winter months come along. They first layer helps to form a waterproof barrier for the skin. As a result their body temperature can stay warm enough even when it is bitter cold. These wolves also have smaller ears than other species. That is part of them staying warm as well. They also help them to regular their overall body temperature. Since the ground is permanently frozen they have padded paws that are designed to offer them a good grip when they walk. Responses to "Amazing Close Encounter With Wild Arctic Wolves Howling And Playing Together In Alaska"